Get past the fiddly interface and you'll fall in love with ReBirth all over again. It's ReBirth! The same features and sound as the original. Interface isn't totally suited to the iPhone. 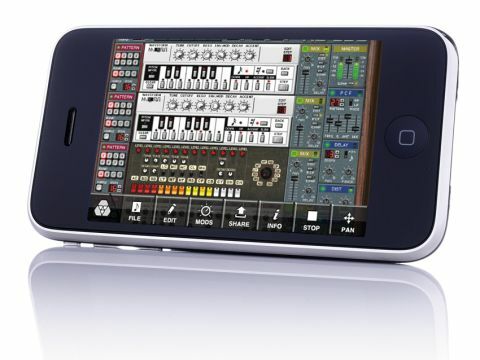 There are two ways to view Propellerhead's port of the seminal ReBirth to iPhone and iPod touch. The first is as a new music production benchmark for the App Store, being in every way the same application that exploded onto Mac and PC in 1997. The second is as a lazily built, rather ill-fitting fingermare that experienced hands will frequently find frustrating and casual users won't have the patience for. Both are right, if we're honest. The interface scales smoothly but not exactly pleasantly - it's bitmapped rather than vector-based, resulting in blurry text and ugly, fuzzy knobs at high zoom settings. And no concessions have been made in terms of making it 'fit' the iPhone - it's literally the Mac/PC version shrunk to fit a smaller screen. But ultimately, and considering the price, none of that really spoils the party. This is ReBirth - two 303s, an 808, a 909, the Pattern Controlled Filter, the compressor, the delay, the step sequencing, the song mode… There are even five user mods included with the software (the mighty PBE among them), while you also have the ability to share your projects online. Equally importantly, ReBirth is simply an awesome nostalgia trip that revives the undefinable magic of the early days of serious computer music. Essential.